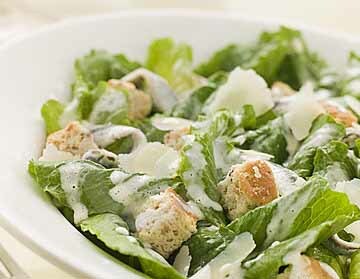 Nothing says gourmet like a rich, creamy Caesar Salad. The silky tartness of the dressing is the perfect counterpoint to the nutty sweetness of the Parmigiano-Reggiano cheese. While most people have had good Caesar Salads, most do not know that a real Caesar Salad does not have anchovies in it. The salty “anchovy” taste came originally from Worcestershire sauce, which my version below contains.This is as authentic as you can get outside of the Hotel Caesar! Turn this refreshing side-dish into the main attraction by serving it with grilled and sliced chicken breast on top of each serving of salad. A glass of chilled crisp white wine is the only other accompaniment a good Caesar Salad needs. Enjoy! In a large wooden salad bowl, using the back of a wooden spoon, mash the garlic and the salt together until they form a paste. Stir in the lemon juice, white wine vinegar, ground mustard and Worcestershire sauce until well blended. Add the egg yolks and, using a wire whisk, blend until smooth. Season with the desired amount of ground pepper. Whisking briskly, slowly dribble the olive oil into the mixture. Whisk constantly until all oil is incorporated and the dressing is creamy. Add the torn lettuce leaves to the bowl and toss well to coat thoroughly with the dressing. Add the grated Parmigiano-Reggiano and toss again to distribute the cheese evenly. Scatter croutons on salad and serve. *CAUTION: Caesar Salad uses raw egg yolks; Raw eggs can be dangerous for infants, pregnant women, the elderly, and people with weakened or compromised immune systems. To avoid the risk of salmonella poisoning, use pasteurized egg yolks.